JACKSON, MI – One of Michigan’s most popular vegan food trucks is causing a stir in Jackson this summer. 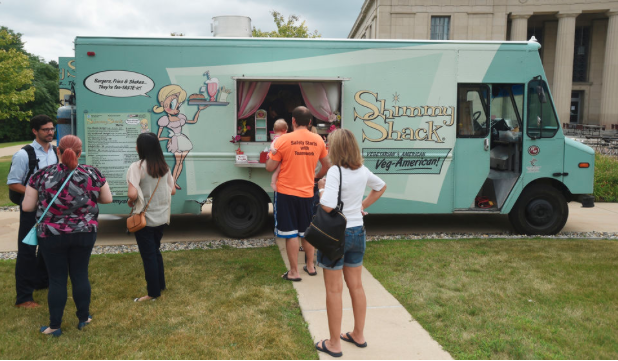 Shimmy Shack’s signature light green finish and 1950s atmosphere is a regular sight at the “Food Truck Tuesday” events, hosted by Consumers Energy. And the food truck has been drawing some of the longest lines there. Every second and fourth Tuesday of the month, food trucks from across Michigan gather at Consumers Energy’s headquarters to provide lunch to the public. Shimmy Shack’s menu features vegan-friendly versions of common diner food. In addition to burgers, fries, chili and nachos, specialty items include the Falafel Pita and a variety of cookies. The food truck also sells several flavors of “milkshakes” with rice-based ice cream and rice milk instead of traditional dairy products. Jakob Smith, 23, was one of the hundreds of Jackson residents flocking to the Shimmy Shack truck on Tuesday on July 24. Shimmy Shack tends to keep its business within a 60-mile radius of South Lyon, where it began in 2013, said founder Debra Levantrosser. The food truck’s appearances at Food Truck Tuesday mark the first time it’s served people in Jackson outside of a handful of catered weddings. Levantrosser has been a vegan for 28 years, which inspired her to open Shimmy Shack. In addition to running the food truck, she also teaches in the University of Michigan’s industrial and operations engineering department. The food truck currently employs eight people, though that number is due to increase when Shimmy Shack opens its first physical restaurant on the corner of Ann Arbor and Sheldon roads in Plymouth in August. Among the employees is Dakota Hawkins, 19, who has been working at Shimmy Shack for four months and will serve as the project manager for the restaurant when it opens. A UM student, Hawkins met Levantrosser through her role as faculty adivser for the Michigan Lean Consortium Consulting Club — a student group that specializes in “lean operations,” or industrial practices that prioritize waste minimization.